The Tennessee Mojo organization, which won a PGF National Championship this summer at 12U, got stronger this week with the creation of a new 14U team. Brooks Cherry, the head of the Tennessee Mojo club organization which has become one of the strongest programs in the East, announced the creation of a new team at the 14U level to be led by Josh Fisher, who is moving over from the Georgia Impact. Emma Langston now with the new Mojo 04-Lewis team. 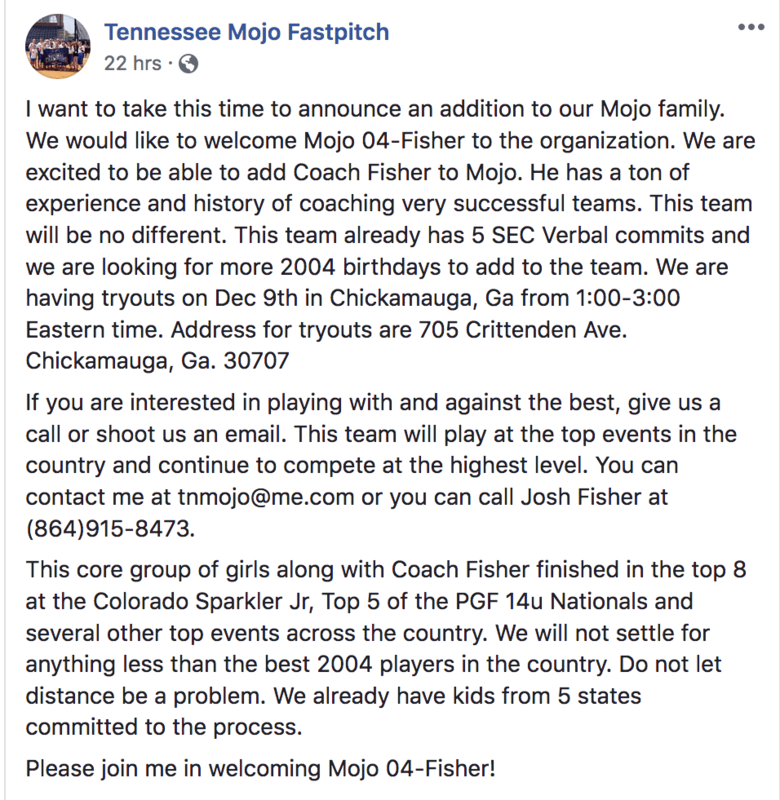 The Mojo 04 - Fisher team will be a second-year 14U team and looks to continue to play top 14U and even 16U and 18U teams with a strong core of five standouts from last year’s Impact-Fisher team expected to come over. 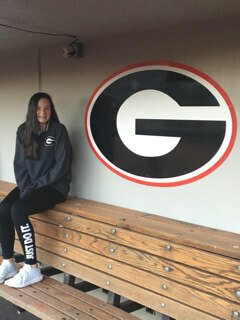 Sources have confirmed that the five players who have moved to the new Mojo 14U team include utility player Jaydyn Goodwin (2002, Georgia commit); pitcher Emma Langston (2022, Georgia); outfielder/middle infielder Caydra Parker (2022, South Carolina); infielder Mia Williams (2023, Florida) and catcher Alexis Winter (2022, uncommitted). Fisher’s team went 58-13-5 last year and was also noted for producing high-level DI talent: the team had nine commits in five months including seven to SEC schools and one each to the ACC and Big South. Ironically, the Impact picked up this fall one of the top 2023’s in the nation, first baseman Angelee Bueno (Florida State) for a showcase, but she soon left to join a Mojo team coached by Michael Danley, whose 2023 team won the PGF 12U Premier National Championship and was selected as the 2018 NFCA Travel Ball National Coaching Staff of the Year. Four committed players are still reportedly with the Impact program: pitcher Kirsten Fleet (2023, Georgia), shortstop Brionna Condon (2022, South Carolina), outfielder/utility player Jadyn Laneaux (2023, LSU) and outfielder/shortstop Taylor Malvin (2022, Syracuse). One name that is being mentioned to build up that 14U team is Rick Jeffreys, who has had great success in the past with the Impact, helping develop players like infielder Hannah Adams (Florida) before he retired and looks to be coming back again.